T-JAWS WATERPROOF JACKET An aggressively styled textile jacket that is ideal for the sport or street rider who wants more protective performance. The T-Jaws is rugged and durable as well as being extremely versatile in many different weather conditions, and features a waterproof membrane and a removable thermal liner. * Multi-material construction with an advanced poly-nylon textile main shell for excellent abrasion and tear resistance. * Outer shell is reinforced with PU for additional aqua-repellent performance. * Waterproof and breathable integrated membrane for added comfort. * Back compartments supplied with replaceable poly-foam padding (CE-certified Bio-Armor back protector accessory insert available). * Flexible microfiber accordion stretch panels on back for performance fit. 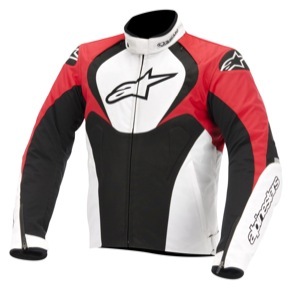 * Chest compartments come with replaceable poly-foam padding (Alpinestars Bionic chest pads available as accessory upgrade). * Impact protection provided by removable CE-certified Bio Armor elbow and shoulder protectors. * Full, removable long sleeve 80g thermal liner for climate control features inner Velcro®-closing wallet pockets. * Zippered shoulder air-intakes for effective regulation of internal airflow. * Integrated, soft microfiber edges on collar and cuff for improved comfort. * Pre-curved sleeves with accordion flex inserts on the elbows for improved comfort and performance fit. * External and internal zippered pockets for peace-of-mind closure. 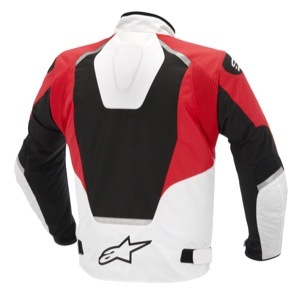 * Reflective detailing on back and arms for improved rider visibility. * Internal waist connection zipper to allow attachment to Alpinestars riding pants. * Cuff adjustment includes Velcro® and semi-auto locking zips for improved range of fit and comfort. * Elongated rear profiling, plus combined D-ring and Velcro® waist adjustment. * Low profile, round-edged collar for comfort features padded 3D mesh for excellent breathability. * Interior water-proof wallet pocket. * TPU reinforced zip pull tabs.